Time is mankinds truest currency, keeping mortals running all their lives. 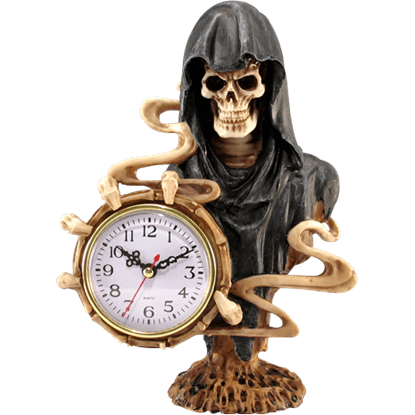 With the Grim Reaper Desk Clock serving as your memento mori, you can make sure that you are spending every second as wisely as possible. Motorcycles inspire an attitude of recklessness and freedom. 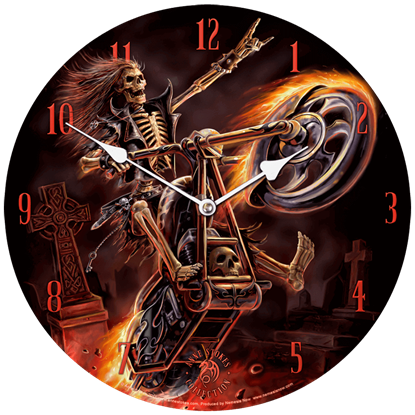 In the Hell Rider Wall Clock by Anne Stokes, this daring skeleton escapes from the grave riding a fiery cycle with an expression of abandon. 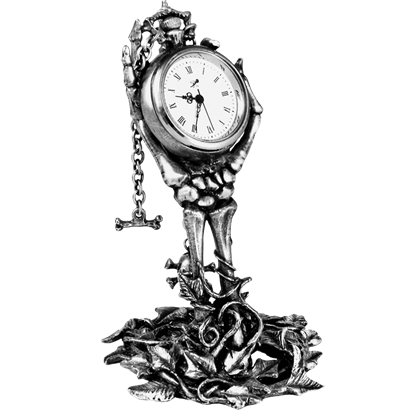 Loosely translating as Hour of Death, the name of the Hora Mortis Desk Clock fits well with the image it bears, that of a hand erupting from the earth, holding a clock, to remind you how much time you have left before you die. Who says the undead have poor taste in music? 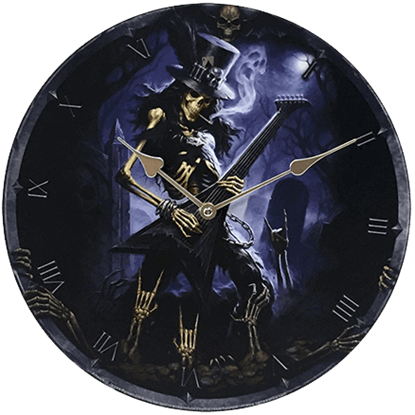 The Play Dead Clock proves otherwise with its spectacular clock face graphic depicting a skeletal rocker in a graveyard, jamming out on an electric guitar under the light of the moon. 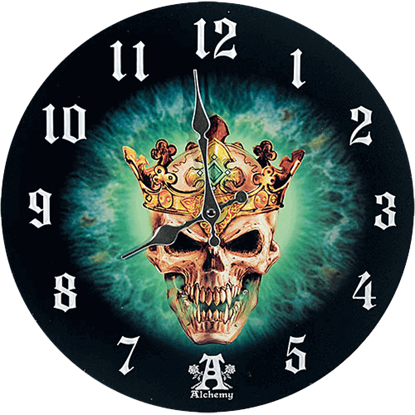 The Prince of Oblivion Wall Clock is proof that royalty will always be royalty, even after death. 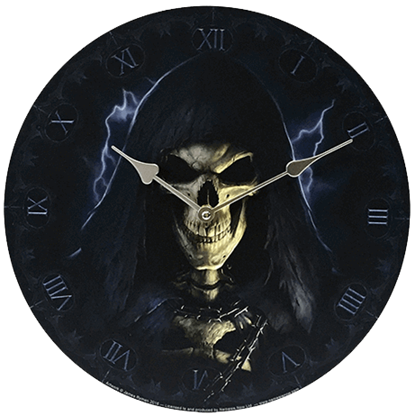 This clock is the perfect way to add gothic style to your decor. 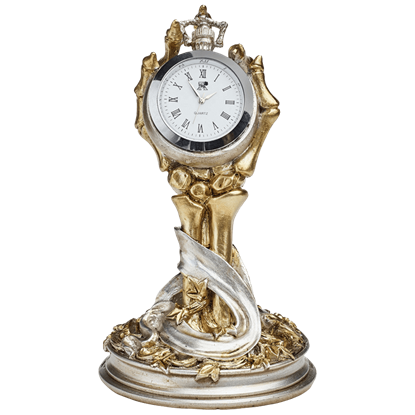 This clock can be used as both a decorative and functional piece. TIME WAITS FOR NO MAN. YOU CAN NEVER TURN BACK. 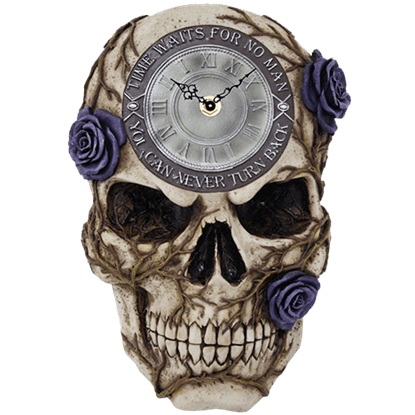 The Purple Rose Skull Clock declares this message around the edges of its clock face even as it depicts the reality of these words. 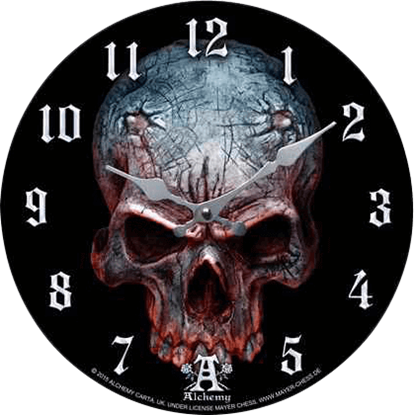 This skull shaped clock is made of cold cast resin. The Angel of Death is one of the most frightening figures imaginable, but when you add a flock of ominous ravens to the mix that terror just intensifies! 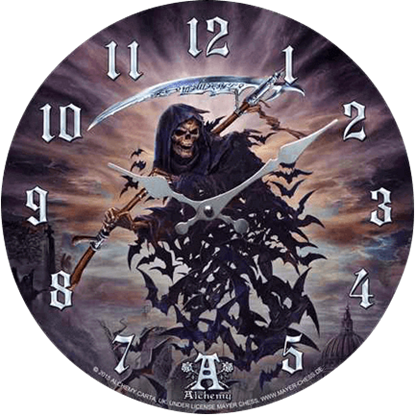 Enhance the Gothic look of your home design with this Raven Reaper Clock. With the speed of a lightning storm, Death comes calling. 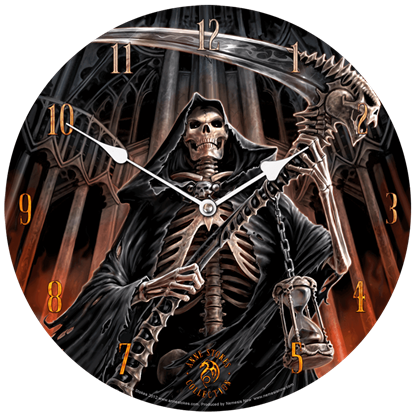 The graphic on the face of the Skeletal Reaper Clock provides an up close look under the hood of the grim reaper. This functional clock makes a great addition to gothic decor.